We supply and fit new quality high performance and budget tyres from brands such as Dunlop, Goodyear, Michelin, Pirelli, Bridgestone and Maxxis. All prices include fitting and balancing and disposal of your old ones. We also provide specialist tyres for other purposes such as trailers, caravans, lawnmowers and wheelbarrows. All tyre checks are FREE. We supply a range of budget and performance exhausts for all vehicles from standard exhaust parts and systems through to performance stainless steel exhaust systems. We can check all exhaust problems you may have for FREE and recommend and carry out any repairs if required or advise and supply a replacement. We can supply exhausts and parts with or without fitting if required. We offer puncture repairs and fix wheel rim leaks at competitive prices along with balancing your tyres correctly. Using modern tracking equipment we can correctly align the geometry of your steering which in return will eliminate uneven tyre wear and improve the steering and safety of your vehicle. We always work to manufacturers recommended specifications for your particular vehicle. Using professional equipment we can quickly diagnose any warning lights or problems associated with engine lights. Don't be fooled into thinking that you need to go to a main dealer to diagnose any of those troublesome faults to obtain their fault codes or reset your service lights. Brakes - Testing, supplying and fitting of discs and pads and other brake components. Suspension - Supply, setup and testing of all suspension related parts including lowering of vehicles. Batteries - Testing, supply and fitting of batteries to suit your particular vehicle. 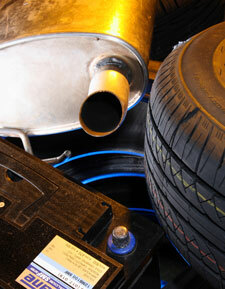 Minor repairs - Minor repairs to your vehicle diagnosed and carried out. Wheel refurbishment - Your damaged alloys professionally repaired and refurbished to look like new. Restore them to their original glory with polishing and repainting. We only use quality parts fitted with professional equipment supplied and fitted at a competitive price.